This is my second favorite record of theirs ("Repeater being the first") and it is a close second. 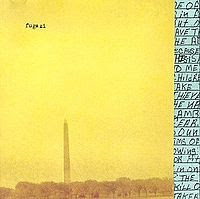 I, like you, will always link this album with that fateful DC show which really was the greatest show I ever saw. That summer I listened to this one pretty much non-stop. I studied the lyrics. I studied the art. It all just seemed so wonderful. I can't name a bad song on this one, even though "Last Chance" is a tad too long. Side A just blows you away out the gate. "Facet Squared" into "Public WItness" is a genius stroke of sequencing. "Sweet And Low" allows you to take a breath and then the rest of side B just tears right through. While their later albums are all good none have the energy that this one does. They seem angry and out to prove something. I also love being able to say that I saw them touring on this album playing at the Washington Monument that is on the cover. For free.